Infrared thermography is becoming recognised as a technique available today for improving quality control of many materials and structures. An infrared thermography test bed named SATIR (Station d'Acquisition et de Traitement InfraRouge) has been developed specially by CEA in order to evaluate the manufacturing process quality of actively water-cooled plasma facing components before their installation in TORE SUPRA. The infrared thermography allows the bond between armour tile and heat sink to be characterised. The quality control of these elements is a necessity to perform a high process reliability, SATIR is becoming more and more a valuable tool for detecting cracks and failures. SATIR gives a global information about the soundness of the heat path thus being a fast and economical way to assess the acceptability of a component prior to its installation into a fusion machine. The control by infrared thermography is an original method, which is used as a receipt tool by the Tokamak TORE SUPRA team (a large facility devoted to nuclear fusion research) in order to guarantee interface quality of the high heat flux components delivered by the manufacturer . This non destructive method enable to qualify the process capability of operation such as active braze bonding which is considered today as sensitive assembly process. To avoid an abnormal increasing of the surface temperature under heat flux, the bond between material must be perfect. The interface quality control based on the study of thermal transfer of the interface can be perform with the industrial infrared thermography test bed named SATIR (Station d'Acquisition et de Traitement InfraRouge). This specific control SATIR (Fig1) is used for locating the existing discontinuities and thereby ensuring the quality and integrity of the metallic assembly. It has been developed specially by CEA in order to evaluate the manufacturing process quality of actively water-cooled plasma facing components before their installation inside the TOKAMAK. A recent technology of braze free bonding was developed for the actively cooled components of TORE SUPRA. It was developed by Metallwerk PLANSEE in Austria and allows the direct application of compliant layer on the base of the Carbon Fibre Carbon (CFC) armour tile by Active Metal Casting copper onto a laser treated CFC surface . This year, in the frame of CIEL project (Composant Interne Et Limiteur), the test bed will be used industrially to test more than 650 high heat flux components designed to sustain an incident flux of 10MW/m2 (Fig2). This recent AMC development is ITER relevant. Each element is cooled by water by means of double channel with a U-turn. SATIR facility uses astutely these cooling inlet and outlet pipes to generate the heat flux waves through the copper / CFC tile interfaces and determines the thermal transient behaviour. The principle is based on the comparison of the surface evolution of same elements during a transient, which is generated by hot and cold front flowing successively in the cooling pipe of the measured element. The choice of hot and cold-water duration and sampling frequency depends on the thermal constant time of the element to be tested. Defect like debonding is detected by a slower temperature surface response. The surface temperature is recorded by mean an infrared camera and a computer (Fig3). 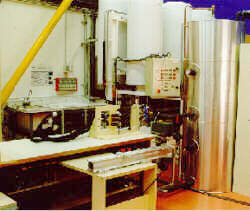 The thermographic film is numerised on a hard disk, and from this measurement infrared data acquisitions are analysed by the specific AIG software jointly developed by CEA and CEDIP society. At each time, the difference between the maximum and minimum tile surface temperatures of the reference element and the test element inside a zone is calculated (DTref). The maximum difference occurring during the heating and cooling cycle is selected (Fig5a). At each time, the difference between the maximum and the minimum tile surface temperature inside each zone is calculated (DTzone). The maximum difference occurring during the heating and cooling cycle is selected (Fig5b). For both the heating and the cooling cycle, the main acceptance criteria for the test of high heat flux component are the DTzone and DTref. The time constant of each tile is analysed too. The geometry tolerances and material property variations play a very important role in the determining acceptance criteria. This influence can be analysed by mean of finite element calculation taking into account material physical properties or thickness effect in addition to the background noise of the camera. In the case of element shown figure 2, the variation of the CFC conductivity of ±5% leads to a variation of DTref = ±0.5K. To respect the geometry tolerance of AMC assembly of ±0.05mm, the manufacturer must machine the CFC part or the CuOFHC part. The variation of the CuOFHC thickness of +0.2mm leads to a variation of DTref= 0.6K. The variation of the CFC thickness of -0.1mm leads to a variation of DTref= 0.1K. The variation of copper alloy thickness of ±0.5mm leads to a variation of DTref= ±1.7K . The infrared system noise must be assumed up to 0.2K. In the worst case if all variation of physicals properties of a tile of the test element deviate from the corresponding tile of the reference element within the possible limits, a measured signal of DTref £ 3K must be considered non-significant. The acceptance criteria DTref of high heat flux element is determined by calculation compared with defects machined at the CFC interface of one element. The "free defect" element has been defined like having the most homogeneous global surface response of analysed batches. The experimental results are compared to the 2D or 3D finite element calculation. The calculations showed that the temperature differences on the surface tile are better correlated to the AMC defect extension, which is the radius of the largest circle that can be shaped in the defect. The temperature differences are plotted versus AMC defect extension and show a correct correlation (Fig7). This comparison experimental defect and finite element calculations is a necessary method to calibrate SATIR with a new geometry. The correlation between SATIR measurement and incident heat fluxes on the TORE SUPRA application is also assessed by calculation (Fig6). For this specific component, the curve (Fig6) shows than a 3K DTref under 10MW/m2 can increase the tile surface temperature of about 200K, which could lead to the carbon pollution of Deuterium plasma. The acceptance criterion of 3K considered like a down limit thermal response lead to detect a defect of 4mm for a strip defect and of 6mm for a corner defect (Fig8). During this year in the frame of CIEL project the SATIR facility controlled mainly the high heat flux components of TORE SUPRA. Many mock-ups have also been individually tested. When an element shows a temperature lag that exceeds the determined limit, this element is observed more thoroughly and can be rejected. The first batches of CIEL elements (83 fingers) have been controlled on SATIR and led to the rejection of 2 elements relegating of 5 doubtful elements. Statistic results of DTref value can be plotted versus tiles (Fig9). The standard deviation graph shows that the acceptance criterion of 3K is qualified on the flat part but we could be too severe on the leading edge (tile1) which use a different geometry. In order to increase the defect detection of SATIR some technical improvements have been investigated. Many test bed parameters can be improved like the spatial / thermal resolution and the background noise of camera, the instrumentation line noise and the heat flux which is depending on temperature scale and also on water flow rate. The emissivity difference on the measured surface takes an important part in this improvement, normalisation algorithms have to be developed to allow the detect threshold to be reduced. In this paper an experimental and calculation study has been made to bring out the SATIR method and the procedure adopted to implement the quality control on important activities including approval of requirements for Active Metal Casting technology and non-destructive examination procedure. This analysis highlighted the measurement accuracy required for the interface quality control. SATIR is a complementary and necessary non-destructive testing method which gives a global information about the soundness of the heat path thus being a fast and economical way to assess the acceptability of a component prior to its installation into a fusion machine. R. Mitteau, P.Chappuis, «Non destructive testing of actively cooled plasma facing components by means of thermal transient excitation and infrared imaging.» presented at 19th SOFT, Lisbonne, Sept., 1996. A.Durocher, P.Chappuis «Infrared non destructive test of plasma facing component, defect detection improvement» presented at 20th SOFT, Marseille, Sept., 1998. N.Thevand, J.Schlosser «Sensibilité théorique de SATIR à des défauts sur les aiguilles du LPT» Note CEA / CFP96064, Mai., 1996.